It feels these days as if every time I venture into the West End I will pass a raft of unfamiliar shiny expensive shops and restaurants and then stumble upon one last holdout from the London that I grew up with. “How on earth has it survived,” I’ll think. And then a week later, I’ll find out on Twitter that it hasn’t. So it is with Soho’s Stockpot, the cheap and cheerful bistro on Old Compton Street that was more than a cafe but wasn’t quite a restaurant. This closes on Sunday after decades of serving starving Soho dilettantes. I started coming here in my early 20s. It was the first time I felt like a proper grown-up because I wasn’t simply eating at Burger King. It was utterly, ineffably London, as if they had distilled the very essence of the city and mixed it into the gravy that they poured liberally over the liver and bacon. 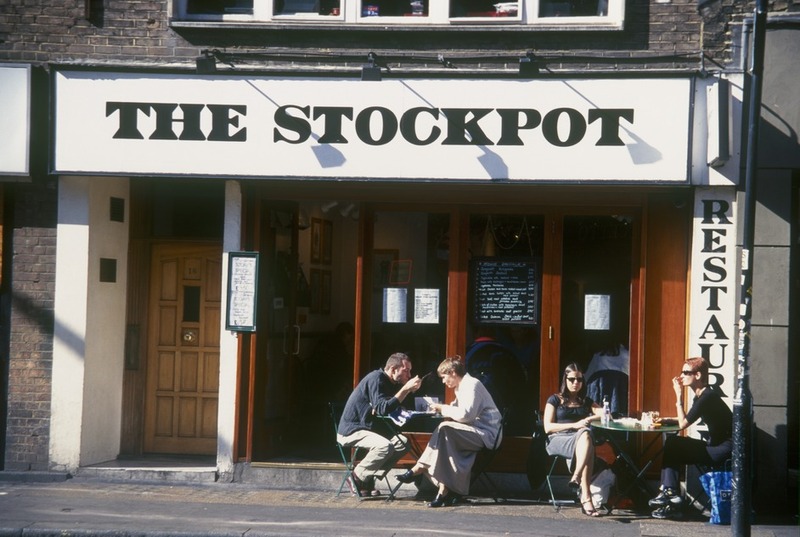 The Stockpot was somewhere you could come at any time, though I was usually there around 6pm before a night out, lining my stomach with cheap carbs before a gig or evening in the local pubs. It was one of the few places where you could order something like gammon and chips, and could be sure of getting a hot main course for under a fiver, which even then was something of a bargain. I often ate there alone, with a book and tumbler of cheap red, feeling mildly bohemian, imagining that I was parking my posterior on wooden benches that had once seated some of Soho’s finest writers, artists, poets, wits and wasters. It felt that a torch was being carried. There was a sense of continuum, of being a tiny part of a magnificent city where progress and tradition could go hand in hand. I loved so much about the Stockpot. I loved the simplicity of its frontage. I loved the way people sat close together, knee to knee, as the waiting staff stuffed another customer into every available space. I loved the menus, handwritten daily but always the same. I loved the ancient brass till that looked like a Victorian musical instrument. I loved the theatrical paraphernalia and overheard conversations of people that seemed like actors and artists but were probably receptionists in a nearby film production company as they gossiped about friends. I really loved the prices. I even loved the food, which was tasty, hearty and filling, precisely what was required before a night exploring Soho’s familiar haunts. Once you’d eaten at The Stockpot, you felt ready for anything, and that the intoxicating adventure that was a young man’s night out in London was already underway. There has been a hole in the centre of Herne Hill since August 2013. That’s when a water main flooded Half Moon Lane closing most of the businesses. All eventually reopened (although some subsequently closed again, defeated by the insurance process) except what’s arguably the most important one: the Half Moon pub, a glorious gargantuan neo-Gothic late Victorian Grade II-listed pub that should be Herne Hill’s crown jewel but has instead been allowed to fester for more than two years, to the lasting shame of landlords Dulwich Estate. This is a fine London pub, which opened in 1896 – a pub has been on the site since the 17th-century – and has featured in graphic novels by Alan Moore, hosted gigs by U2 and Frank Sinatra, comedy shows by Eddie Izzard, and whose former drinkers include Dylan Thomas, who took the name of Under Milk Wood from the nearby Milkwood Road. Now, it’s dead, boarded up, dilapidated and rotting from within. So how has this come to pass? Locally, rumour and counter-rumour have swirled about its fate. The chief sticking point is that there are several floors above the pub – these once contained boxing a gym where I spent an exhausting three minutes being chased round the ring by a former middleweight champion – that represent a huge financial opportunity. Attempts to convert them into residential flats went nowhere and it’s said that Dulwich Estate, who look after the interests of the wealthy nearby private schools as well as a couple of other pubs, wish to turn it into some kind of boutique hotel as they are doing with the Crown and Greyhound in Dulwich Village. This would almost certainly spell the end of live music at the large function room attached to the pub. This 200-capacity room has a surprisingly rich history as a London venue, as I discovered when talking to Peter Blair, who is leading the Save The Half Moon campaign with the Herne Hill Forum, fed up of the secrecy, silence and endless rumours. Last week, Blair submitted to Southwark papers that would see the Half Moon listed as an Asset of Community Value that focus on its history as a music venue. He believes that while the pub will eventually reopen – because of the listing status, Dulwich Estate can’t really do anything else with the handsome ground floor bars – the live music component needs to be understood, celebrated and protected. The closure of London’s live venues has reached such epidemic proportions that even the mayor wants to do something about it. Campaigners have been exploring the pub’s history and have discovered it was a crucible for London’s live blues scenes in the 70s – sessions featured an array of musical talent from the most popular bands of the era including members of the Jeff Beck Band, Rory Gallagher band, Thin Lizzy, and 7th Wave. An account of its history can be seen in this film. It remained a music venue for the next four decades. In 1980, U2 played an early gig. In the 90s, the house PA was owned by Alabama 3 and gigs included Big Joe Turner and Geno Washington. More recently it hosted Devon Allman from The Allman Brothers and guitarist Albert Lee. Damn straight: Leslie Nielsen even filmed a commercial in there. If the campaigners win their bid to get the pub listed as an Asset Of Community Value, it will mean Dulwich Estate will have to consult the Herne Hill Forum over their plans, finally bringing them out into the open. “Out understanding at this point is that they wish to use the function room as a restaurant,” says Blair. “We want them to explain their plans in full, and to ensure live music is a key component of the new pub, whenever it opens. If it is converted as a hotel, how will that effect the music venue? We have no intention of making it unviable but we want to know what it will be when it opens.” The campaigners have no interest in purchasing the venue, which would cost a fortune but have been in discussion with the nearby Ivy House, who used Asset of Community Value status to purchase their local pub from developers. There’s also the question of when it reopens. While Dulwich Estate is said to be in negotiations with several pub chains – “everybody you speak to has a different name” – it’s unlikely to open in the next 12 months. Since it closed, no restoration has taken place at all and it’s said the pub, which was at the very centre of the flood and thus under water for some time, is in very poor condition. It seems astonishing that a listed venue can be left to rot by a landlord that is supposed to have local interests at heart, especially when one presumes there is insurance money on hand to fix the damage. It’s a sad state of affairs for what should be a south London landmark. To keep up to date with the campaign, see the Facebook group. While researching my recent feature on the Blitz and former bombsites in London, I was keen to find a site that had been destroyed and not yet redeveloped. There were some tantalising leads. Peter Larkham, professor of planning at Birmingham School of the Built Environment, provided me with an image he’d discovered years before of a derelict building on Lowndes Street, left fallow in memory of the Blitz. It’s a compelling story but one that was difficult to confirm. The Bomb Damage Maps showed a couple of strikes on Lowndes Street so I sent an email to Dave Walker, librarian at Kensington and Chelsea and writer of the formidable Library Time Machine blog. Dave put the query across to a colleague at Westminster, as Lowndes Street straddles the boundary between the two councils. Between the two of them, they discovered destroyed buildings at No 30 and Nos 11/12 Lowndes Street but both sites were developed by 1963. It would require further research to get to the bottom of the story as outlined by Professor Larkham and as tantalisingly revealed in the above photograph. There was similar confusion with regard to another site. This was next to the Hat & Feathers pub on Clerkenwell Road. According to local legend, the site had been demolished by a bomb and used as a car park ever since. For years, you could even see scraps of wallpaper from the destroyed building still attached to the neighbouring wall. The only problem was there was no record of a bomb landing anywhere near this property – itself rather extraordinary given how badly the area had been bombed. It appears that this was a false folk memory, but one that was still being shared today. In the end, I included no empty lots in my piece as I couldn’t find any that comfortably fitted the available facts. After my piece was published, I was contacted by a photographer, Thom Atkinson. He was about to publish a book called Missing Buildings, looking at precisely this area – the missing spaces between London buildings ostensibly created by bombs. They’d even included an image of the Hat & Feathers site I’d been studying. Like me, Atkinson was intrigued with the way folk memory and evidence didn’t always correspond. Missing Buildings is a wonderful book, showing the ghosts of London homes, many of which have long disappeared but still leave an imprint on neighbouring buildings in the form of shadows, new brickwork, girders and the spectres of chimney breasts. Others have been filled in with new buildings that stand out ridiculously against their neighbours, awkward and ugly, eternally temporary. There are more of these spaces than you might imagine in London, but they are vanishing fast and this book is an exquisite record of the spaces that get left behind, often more by accident then design. You can buy it here.